Molecular techniques allow detecting and determining the population dynamics of a bacterium that uses ticks as vectors. Investigators processing rodents - Female tick (Amblyomma triste). Photo: courtesy Georgina Tumini (ICIVET). Lucas Monje at his lab. Photo: CCT Santa Fe. Lucas Monje is 35, holds a PhD in Biological Sciences and is a CONICET assistant researcher at the Laboratory of Disease Ecology of the Institute of Veterinary Sciences (ICIVET-LITORAL, CONICET-UNL). Although he works in the field of molecular biology, “the subject that I became directly involved with is an investigation that tries to elucidate the eco- epidemiology of Rickettsia parkeri, a bacterium that causes emerging infectious diseases”, he explains. The objective of the investigation is to find decisive factors of the Rickettsia parkeri ecology, to detect which variables can affect its abundance, its niches, its hosts and why is it that in some places it is more abundant than in others. This is the reason why the investigation of a molecular biologist involves conducting field investigations in order to collect samples, making contact with local people and learning to wait under the rain and with cold. To sum up, an off-road scientist. In the Paraná Delta, Rickettsia parkeri, a very small and ancestral bacterium that needs to parasite in a cell to reproduce, was detected and reported in 2008. 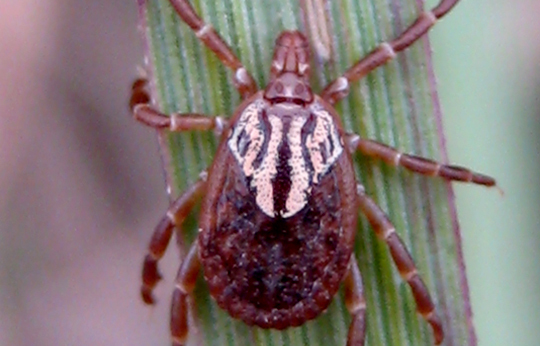 This organism causes rickettsiosis, an infectious disease that is transmitted to human via the bite of ticks, which are its vectors. R. parkeri is a bacillus-shaped bacterium about 3-4 micrometres (µm) long, that is to say, 3 or 4 thousandths parts of a millimetre. That is why, in order to advance knowledge of this disease, it is essential to study it at a molecular level. “This parasite is an alphaproteobacteria, that is to say, a very small and ancient bacterium. Its detection would be very difficult without techniques such as the Polymerase Chain Reaction (PCR), that allows to amplify a sector of a gene in real time. For instance, if I have a tick infected with a bacterium, I will obtain an extremely complex sample of DNA after extraction. Trying to find the bacterium would be like looking for a needle in haystack. What we do with the PCR is to amplify a fragment. That small portion is copied in an exponential way and at the end of the reaction, instead of having a needle, I have a lorry full of needles, which is easier to find”, he analyses. To detect the DNA of Rickettsia parkeri in a sample of DNA of a tick is a very complex task. As the real time PCR allows amplifying a fragment of genetic material, the chances of identifying the bacterium increase. The great advantage is that, apart from detecting rickettsia, it also indicates its levels and thus determines the different degrees of infection. Rickettsiosis is one of the so-called ’emerging infectious diseases’, which are those that have newly appeared or that have existed in the past but are now rapidly increasing in frequency, geographic range, or both and thus constitute a threat to public health. “Due to the fact that it is a new disease, one of its greatest problems is the lack of knowledge. Sometimes it is misdiagnosed or confused with dengue or leptospirosis due to the lack of diagnostic tools. Therefore, we are developing a serological test to detect whether rodents and bovine animals were exposed to this disease and to confirm suspected cases of human rickettsiosis”, he comments. Although Rickettsia parkeri is not fatal to humans, it causes high temperature, headaches, skin lesions, tiredness and weakness, among other symptoms. The best prevention is prevention, education and awareness-raising campaigns to avoid contact with ticks. To extract the DNA, Monje first needs to collect disease-carrying ticks by either capturing rodents infected with ticks or the ticks themselves using a curious “fishing” method. Adult ticks can be collected using a piece of fabric that is dragged on the vegetation for ticks to attach to it. Afterwards, the DNA will be processed using real time. Between 2010 and 2012, together with the rest of the investigation team, they conducted 22 campaigns to sample ticks and rodents; and they also extracted blood from bovine cattle to detect traces of the disease. “The project has a very long incubation period due to the campaigns. They consist of trips to the Paraná Delta during four days, during the nights we place about 220 traps in groups of 4 or 5 people per campaign, during two years and a half. It is only after that that we started analyzing the samples and obtaining results”, he analyses. By Paula Pochettino. CCT Santa Fe.